Okay, I'm going to lay out some funky be-bop here. Let's see if you guys can pick up the tune. The Tick might be the only reason I was capable of waking up before noon on a Saturday in my teens. The show still ranks among my favorite animated series of all time. As for the game which appeared on 16-bit systems, not so much. I remember it as being a fairly substandard brawler with mediocre gameplay and some really annoying shortcomings. I could be wrong, right? It's one of of those licenses that I simply love too much to outright dismiss its game on the basis that I played it fifteen years ago and didn't have a very good time. So, without further ado, SPOOOOOOON! If you somehow missed out on Saturday morning cartoons in the nineties, The Tick follows the adventures of its titular character as he protects "The City." With wildly creative villains constantly threatening to destroy the peace in his adopted metropolis, this bumbling and inept but utterly invincible superhero continually saves the day from ludicrous plots through sheer determination and blind luck. It was one of the most amusing cartoon series of its day and one which managed to cross generational lines by combining smart and subtle humor with slapstick antics. Developing a quality videogame based on a licensed property from another medium is never an easy task. All too often, they fall into the trap of becoming generic games which merely feature the notable characters and events which take place within the setting. 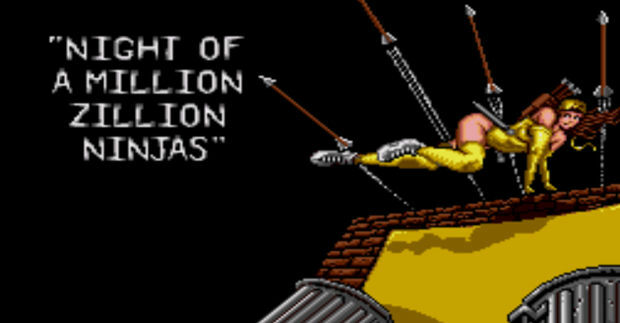 Imagine for a second, however, how much more challenging it would be to create a game based on a series in which the main character is essentially invulnerable to bodily injury. Basic conventions of videogames and how they are made to be difficult to complete would have to essentially go right out the window. The Tick winds up treading a fine line in this respect. 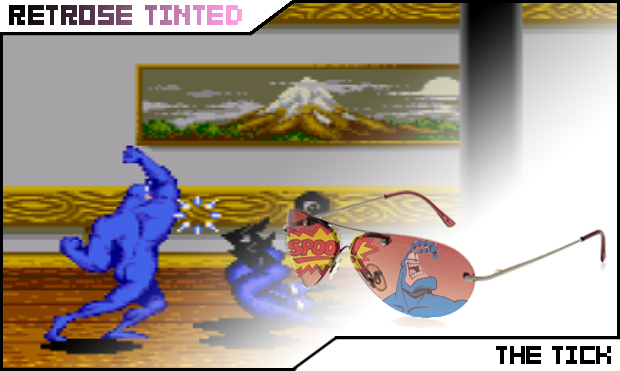 Simply allowing The Tick to run roughshod over anything in his path would have been unbelievably dull as an experience, so he has been made defeatable in this side-scrolling brawler. He does, however, have the capability to survive events that would outright kill heros in most games and the designers chose to reflect this in some interesting ways. First, he can take a serious beating before losing a life. Most levels in the game are simple enough to traverse without dying a single time, provided the player is cautious. The best representation of his superior resistance to damage comes from taking falls. 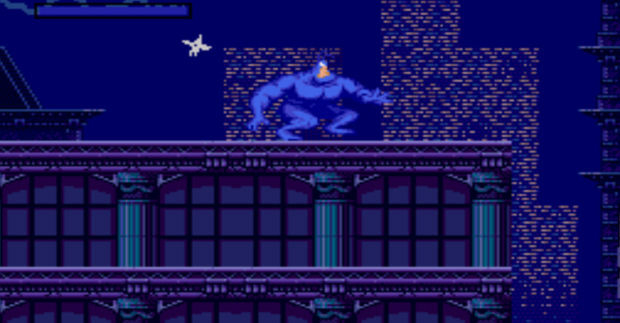 The Tick's primary method of transportation in the cartoon series was to run across the rooftops of The City and the game makes use of this for very basic platforming areas to break up levels with a heavy focus on combat. Should the player miss a jump between buildings, it does not result in death as one might come to expect. 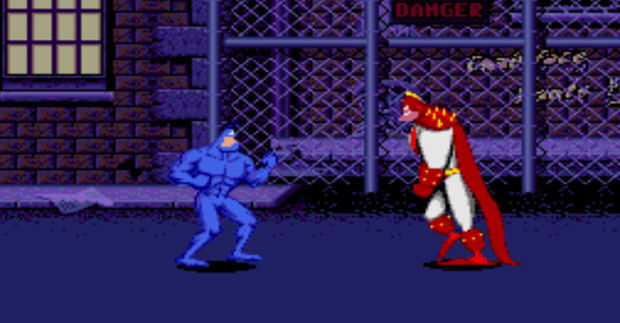 Instead, The Tick drops down to street level and must defeat one of the show's lesser villains in a mini-boss encounter. Once the bad guy is defeated, Tick returns to the roof he fell from and can continue to progress through the level. On the one hand, I can't get over what a stroke of genius this is. Here we have a situation where the player is well and truly punished for failing to complete their task while offered an opportunity to minimize the consequences by playing through the boss encounter efficiently. On the other, it can be really frustrating at times to have to face some of the same enemies over and over again due to the game's stiff jumping controls. And some of the mini-bosses are incredibly difficult to defeat. One villain whose design is particularly poor performs his attacks by simply running through Tick, plowing him into the ground. 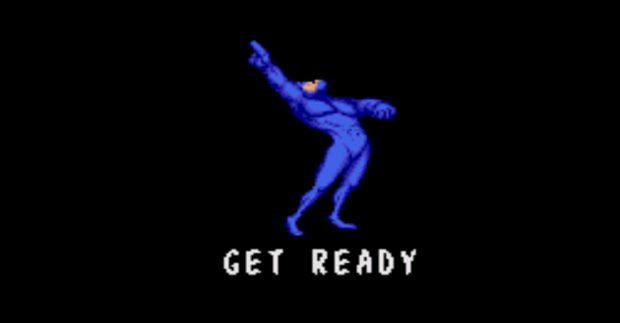 Timing attacks to hit him is not very difficult but it becomes an issue when the enemy rises back up, as he will almost always hit you as he continues his run across the screen. The Tick featured not only memorable supervillains in its cartoon series, but offbeat and humorous heroes as well and it wouldn't be a fair representation of the show without their appearance. Throughout the game's levels, power-ups which call forth one of these heroes to partner up with Tick can be found. The hero drops in and fights back-to-back with Tick, giving the player an advantage in not having to turn around to face enemies coming up from behind. These sequences are fun but the characters chosen to join him are not exactly the most popular from the show. Why characters such as The Breadmaster and Oedipus (a character spoofing Marvel comic character Elektra) would be chosen over classic Tick heroes such as American Maid and Die Fledermaus is completely beyond me. 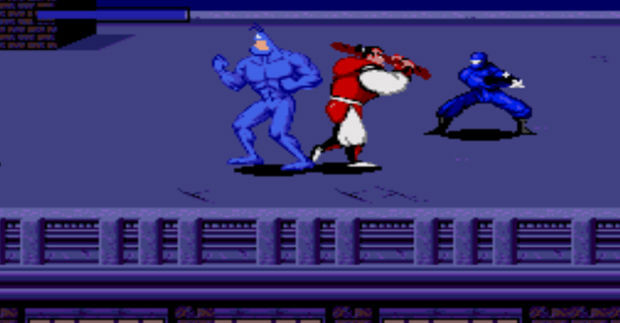 Other notable characters who would have made fine additions to his arsenal are relegated to background appearances in the environments or minor obstacles for both Tick and his enemies. Ultimately, The Tick still manages to fail, in part because so many of the interesting characters fail to appear but also because it's a fairly dull brawler in general. Enemies are essentially an endless swarm of cookie-cutter ninja and Tick might as well be invincible for as much fun as beating on the same five enemies for a few hours winds up being. It's charming for about ten minutes before I would rather be playing just about anything else.